This habitational name is an excellent example of how surname and village name spelling has changed with dialect over the centuries. Akehurst almost certainly derives from the village of (now) Oakhurst, in the county of Hertfordshire. In the Anglo-Saxon Chronicles of the years 944 - 946 A.D. in the reign of King Edmund (939 - 946), the village is recorded as "Acersc", translating as "the oak park". By the year 1287 the spelling had become Okersh, with "Oakhurst" being circa 1600. The surname as Akehurst appears to be particularly associated with Sussex, which may be accidental through a mass movement from the original village, or it may be that a now "lost" site called "Ac-hurst", or similar, also existed in the Sussex region. 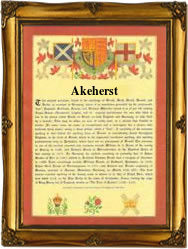 The name has a number of variant spellings, these include: Ackhurst, Akehurst, Akhurst and Akeherst. The first recorded spelling of the family name is shown to be that of Johan Akehurst, which was dated 1578, baptised at Wilmington Church, Sussex, during the reign of Queen Elizabeth 1, known as "Good Queen Bess", 1558 - 1603. Surnames became necessary when governments introduced personal taxation. In England this was known as Poll Tax. Throughout the centuries, surnames in every country have continued to "develop" often leading to astonishing variants of the original spelling.